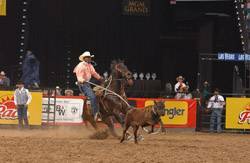 Born on Aug. 5, 1967, in Houston, Fred Whitfield grew up roping anything and everything in sight. Little did he know at the time that his talent would take him to the pinnacle of ProRodeo success. As of 2003, Whitfield has won eight world titles, including seven in tie-down roping and one in the all-around during his storied career; became the third cowboy in history to surpass the $2 million mark in career earnings; and became only the second African-American cowboy in PRCA history to win a world title and the first to win an all-around title. Always cool under pressure, Whitfield has made a name for himself in ProRodeo by consistently coming through in clutch situations. His signature “raise the roof” salute caught on with fans across the country who have become accustomed to his dramatic victories. Befitting a cowboy of his stature, Whitfield has won titles at virtually every major rodeo, including four Wrangler NFR aggregate crowns. His 10-head total of 84.0 seconds en route to the aggregate title in 1997 established a Wrangler NFR record and is considered one of the greatest performances in the history of the Wrangler NFR.